Apples are a great diet food, and knowing how many calories are in an apple can help you fit them into your daily foods. Apples are high in nutrients and fiber. Their crunch and sweet taste provides a satisfying eating experience, while their low calorie count and high fiber make them an ideal diet food. As with many foods, the calorie count depends upon the serving size. There are many varieties of apples available in the grocery store ranging from bright green Granny Smith apples to ruby red Delicious. Each varieties varies in size, ranging from tiny Pippin apples the size of pool balls to huge baseball or softball sized Granny Smith, MacIntosh, or Cameo apples. Removing the peel lowers the calorie count slightly, but you'll also remove much of the vitamin C and fiber. It's best to eat apples with the peel. If you're concerned about waxes and chemicals used on apples, switch to organic apples. The calorie count is the same for conventionally grown and organic apples. Small: 2 ¾ inch diameter, contains 77 calories per serving. Large: 3 ¼ inches in diameter, contains 116 calories per serving. "An apple a day keeps the doctor away" is an old maxim that could be true thanks to the nutrients packed into each apple. While people tend to think of oranges and grapefruits as good sources of vitamin C, a large apple contains almost a quarter of your daily requirement for vitamin C. Eat an apple, drink a glass of orange juice and you'll easily reach your minimum daily requirement.Apples are also abundant sources of fiber, necessary for colon health and digestion. 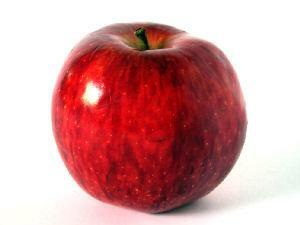 A large apple contains 5 grams of fiber. Most sources recommend a target of 25 to 30 grams of fiber per day for the average adult. Eat your five fruit and vegetable servings daily and you're much more likely to reach your target! So no matter how many calories are in an apple, they're a great choice for low fat, portable snacks. Keep a bowl of fresh apples on your desk at work to snack on. Stock your refrigerator with them; they'll keep for weeks. But most of all, enjoy an apple today.